Clients who eat a dairy-free diet have myriad food choices that will enable them to get most of the nutrients they need without sacrificing taste. Whether it’s allergies, a vegan diet, or another health concern, many people decide to stop eating dairy—from the cow’s milk that soaks a bowl of cereal to the butter that coats a piece of toast. Allergies and intolerances are major reasons for going dairy free, especially considering the Food Allergy Initiative’s statistic that cow’s milk allergy is the No. 1 food allergy in infants and children. Nevertheless, there are other issues that play into a client’s decision to go dairy free. 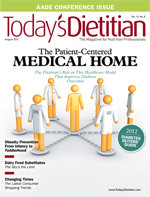 This article will discuss these issues and provide a wide variety of the most healthful nondairy foods clients can eat to get the nutrients they require. “Some people forgo dairy because they’ve read that a dairy-free diet may help alleviate certain problems, including digestive distress, an inability to lose weight, acne, and irritable bowel syndrome,” says Rania Batayneh, MPH, owner of Essential Nutrition For You. Others may choose to eliminate dairy from their diet due to a vegan lifestyle. And still others give up dairy to avoid the antibiotics and hormones that are often administered to cattle, says Rebecca Dority, MS, RD, LD, CDE, an instructor in the department of nutritional sciences at Texas Christian University. Whatever factors into someone’s reason for living without dairy, it’s important to ensure clients are still getting the nutrients they need that are found in dairy products. “Dairy foods provide several important nutrients, including protein, vitamin D, and minerals such as calcium and phosphorous,” says Mark Levy, PhD, a senior scientist at USANA Health Sciences. “In fact, milk may be the leading food source of vitamin D, calcium, and phosphorous in the American diet. For consumers who don’t eat dairy products, it’s vital that they acquire these particular nutrients from other food sources. Nondairy sources of calcium include leafy greens and broccoli, Batayneh says. Chia seeds, flaxseeds, and sesame seeds as well as quinoa also are rich sources. For the potassium typically found in dairy foods, clients can try sweet potatoes, beet greens, and tomatoes. “And mushrooms are the best vegetarian food source of vitamin D,” she adds. For vitamin B12, which is generally found in meat and dairy, Batayneh directs clients to fortified cereals, fortified soymilk, meat substitutes, kale, and nutritional yeast. However, Batayneh says it can be difficult to get all the nutrients typically found in dairy products from whole foods. For instance, “You’d have to eat 3 cups of collard greens to meet the RDA [Recommended Dietary Allowance] for calcium,” Batayneh says. Because of this, fortified foods, such as soymilk, can be helpful for supplementing the diet. This is especially relevant for vitamin B12, which is generally found in animal products. “One bonus of fortified foods is that since many vitamins are fat soluble, such as vitamin A and vitamin D, ingesting them with food actually maximizes their absorption,” she says. So have clients read nutrition labels and refer to our dairy-free product roundup for a summary of what’s available in the way of dairy alternatives—and learn how each stacks up in nutrient content, taste, and availability. • Soymilk: Of all the dairy-free milk alternatives, soymilk is likely the most recognizable to your clients and also the most widely available in grocery stores today. “Notably, soyfoods are the only plant-based complete protein source and are therefore the preferred dairy substitute,” and they’re vegan friendly, adds Levy, noting that soymilk is also a good source of manganese and magnesium. Various soymilk brands are available at grocery chains and health food stores nationwide, with Silk and Earth Balance being two popular choices. For clients looking to save a buck, have them keep an eye out for grocery store chain brands, such as those from Trader Joe’s or Whole Foods Market. • Rice milk: Rice milk, made from boiled rice, brown rice syrup, and brown rice starch, is another popular alternative for clients suffering from lactose intolerance, Levy says. “Rice milk generally tastes sweeter than cow’s milk, owing to the addition of sweeteners and vanilla in order to make it taste more like cow’s milk,” he says. Rice milk comes in plain, vanilla, and chocolate varieties and can be found at most major grocery stores and health food stores, especially organic grocery stores, though Levy warns of its higher price tag. Have clients test out brands until they find one with a taste and texture they prefer, though Dority says Rice Dream is generally a well-liked and commercially available brand. • Potato milk: Potato milk is one of the newer dairy-free milk alternatives and therefore more difficult to find commercially than rice or soymilks, Dority says. “It appears to be most commonly sold in powdered form,” she says. Like rice milk, potato milk is high in carbohydrates but low in protein, though it’s usually fortified with calcium and vitamins. It’s also gluten and casein free. “Made from just potatoes and water, it’s suitable for those on a gluten-free diet,” Batayneh says. Since it’s a new kid on the dairy-free block, Batayneh suggests clients look for it on the Internet (it’s mostly available via websites), though she notes it tends to be expensive. • Almond milk: Almond milk, another alternative, is made from ground almonds, water, and a small amount of sweetener. And while it can be formulated to have a taste and texture similar to cow’s milk, Levy says it’s lacking in many of the nutritive qualities. Because of this, Levy says it should be used accordingly, noting it may not be appropriate for parents shopping for a milk substitute for infant formulas. However, Batayneh says many of her clients find the taste of almond milk more enjoyable than other substitutes, and it can be found in most grocery stores and health food stores in the refrigerated and nonrefrigerated sections. “A unique aspect of the nutritional profile of almond milk is that 1 cup of almond milk may contain roughly 50% of the DV [Daily Value] for vitamin E,” says Dority, noting that Almond Breeze is one popular and commercially available brand. • Oat, hemp, and coconut milks: Oat milk, which is made from oat groats, water, and potentially other grains and beans, such as triticale, barley, brown rice, and soybeans, has a mild flavor and is slightly sweet, which makes it a good substitute for low-fat or skim milk, according to Dority. Low in overall calories, cholesterol, and saturated fat, it’s high in fiber and iron and contains both vitamin E and folic acid, says Batayneh, who cautions against its use by clients with a gluten sensitivity. Hemp milk, typically made from hulled hemp seeds, water, and a sweetener, contains higher amounts of protein and omega-3 fatty acids but lacks calcium. “It’s a good alternative for those with gluten, nut, and soy allergies,” Batayneh says, though it’s not widely available. “Coconut milk is higher in calories and fat than most milk or milk alternatives, and it contains fiber and iron, two notable differences in the nutritional profile compared to cow’s milk,” says Dority, who cautions that its strong flavor may limit its use for some clients. “Coconut milk contains 5 g of saturated fat per serving, but research has shown that the specific saturated fats in coconut oil may actually be beneficial,” Batayneh says. For dairy-free clients who are cooking aficionados, Batayneh says almond and coconut milks are generally best for baking “because their nutty flavors blend well with the sweetness in baking.” She recommends soymilk for savory dishes, “especially Asian ones, because it can leave a slightly ‘beany’ taste.” She cautions against using rice milk in recipes due to its watery texture. • Cream cheese: There are numerous soy cream cheeses on the market, which tend to be the most popular dairy-free versions, including those made by Tofutti, Galaxy Nutritional Foods, and Trader Joe’s. According to Batayneh, these soy-based varieties have similar tastes and textures to regular cream cheese, which is why consumers like them, but they also can be more processed, as many contain thickeners such as maltodextrin. “There are recipes for homemade versions, like almond cream cheese,” she says, for clients with the time and initiative to try making their own varieties. • Sour cream: Soy-based sour creams are the most widely available dairy-free alternative to sour cream, though clients likely will have to go to a health food store to find them. • Regular cheese: “Due to the various sensory characteristics associated with cheese, it appears that dairy-free cheese is the most difficult to substitute,” says Dority, adding that dairy-free cheeses often don’t mimic the mouthfeel, taste, and meltability of dairy cheeses. Soy cheeses tend to be the most common and widely available. “Brands such as Teese, Sheese, and Vegan Gourmet are popular choices and have received good reviews,” Batayneh says. For another alternative, Dr. Cow makes nut-based cheeses using cashews and macadamia nuts. “These can be found in health food stores and some major grocery stores as well as bought online,” Batayneh says. • Ice cream: Dority says rice-based ice creams are a popular alternative due to their sweetness, noting that Rice Dream is a popular brand. “Soy-based ice cream also is easy to find in stores,” she says. So Delicious offers soy, almond, and coconut milk-based ice creams, available in various flavors and chocolate-covered ice cream and fudge bars (with a mini version with fewer calories). Those on a dairy-free diet also can enjoy most sorbets and fruit-based icy treats that are naturally dairy free. • Whipped cream: Batayneh says the market for dairy-free whipped cream is relatively small, so clients will have to go to health food stores to find it. She says Soyatoo! Whip Topping is a popular soy- and rice-based variety, and MimicCreme Healthy Top Whipping Cream is a good nut-based alternative. Rich Whip Non-Dairy Whip Topping is another whipped cream alternative for clients going dairy free. However, just because they’re free of dairy doesn’t mean they’re necessarily the best options for clients. “These options are all relatively processed, and Rich Whip contains high fructose corn syrup and partially hydrogenated oil,” Batayneh says. For a less processed topping for a slice of summer peach pie, suggest clients make their own. “A popular alternative is making homemade whipped cream using coconut milk,” says Dority, who refers clients to the Internet for coconut-, almond-, or cashew-based whipped cream recipes. • Cheesecake and other sweets: Dairy-free cheesecakes can be difficult to find in stores, Batayneh says, so she directs clients to specialty bakeries, which may be more likely to carry them. There are also several online retailers offering dairy-free cheesecakes, including The Raw Vegan and Vegan Essentials. “Earth Café, which is sold at Whole Foods Market and Vitamin Cottage as well as a few other natural health food stores, also makes a line of vegan, gluten-free cheesecakes in addition to other desserts,” Batayneh adds. There are numerous specialty bakeries that make vegan and otherwise dairy-free sweets, and many ship nationwide. Isabella’s Cookie Company is one such bakery that offers vegan cookie options. • Yogurts: Soy-, coconut-, and nut-based yogurts all can be found in major grocery stores and health food stores, with soy-based versions being the most readily available. Batayneh’s favorite varieties include WholeSoy & Co, which she says comes in 12 flavors and tastes similar to regular yogurt. “It also contains vegan probiotics,” she says. She also likes Nu Lait Dairy Free Yogurt, which is coconut or almond based and soy, gluten, and allergen free. • Smoothies: Major smoothie brands, including Odwalla and Naked, carry dairy-free products, so Batayneh tells clients to look for Odwalla Smoothie Refreshers and Naked Oat Smoothies to quench their thirst sans dairy. These typically can be found at grocery stores and health food stores nationwide. For homemade smoothies, Dority says rice milk has a natural (or added) sweetness that tends to complement the other ingredients in a smoothie. “Depending on the additional ingredients, both coconut and almond milk might provide a unique flavor. Clients who like the taste of Earth Balance may like its butter sticks, which are especially useful for baking. For clients who want a texture similar to real butter and don’t mind a slightly nutty undertone, coconut and cashew butters, such as those made by Nutiva and Artisana, may be good choices for them. • Margarines: Different kinds of dairy-free margarine options are available, though not all are equal in nutritional value. Mother’s Margarine and Fleischmann’s Light are two options, but Batayneh cautions that some dairy-free margarines can contain trans fats, so make sure clients read food labels before buying them. One variety that has no trans fats is Earth Balance’s Organic Coconut Spread, which Batayneh says tastes similar to margarine and is also soy free. — Juliann Schaeffer is an associate editor at Great Valley Publishing Company and a frequent contributor to Today’s Dietitian. 1. Preheat oven to 400˚F. Line baking sheet with parchment paper. 2. Stir together water and flaxseed meal in a small bowl; let stand 10 minutes. 3. Whisk together flour, sugar, baking powder, baking soda, and cinnamon in a large bowl, food processor, or stand-mixer bowl. 4. Cut Earth Balance Coconut Spread into the dry ingredients using a pastry cutter, food processor, or stand-mixer paddle attachment. 5. Stir in flaxseed meal mixture and yogurt until just mixed. Gently fold in berries. 6. Turn dough out onto flour-dusted surface and form into a 3/4-inch thick rectangle. 7. Cut into triangles using a large knife or bench scraper. 8. Place scones onto baking sheet. Mix sugar and cinnamon together and sprinkle over the tops of the scones. 9. Bake 8 to 10 minutes, until lightly browned. Be careful not to over bake. Note: We made our gluten-free scones vegan with an easy egg substitute of 1 T of flaxseed meal mixed with 3 T of warm water per egg needed. Just let the mixture sit for 10 minutes until it thickens. This works well in most baked goods, including cakes, cookies, and muffins. 1. For the soup, halve avocados and remove flesh with a spoon. 2. In a blender, purée the avocado, green onions, Silk soymilk, Silk creamer, ice water, lime juice, and salt. 3. Season to taste with black pepper and cayenne. 4. Thin with additional soymilk if desired. 5. For the salsa, mix all ingredients together in a small bowl. 6. Serve as garnish for avocado soup or with tortilla chips as an appetizer.